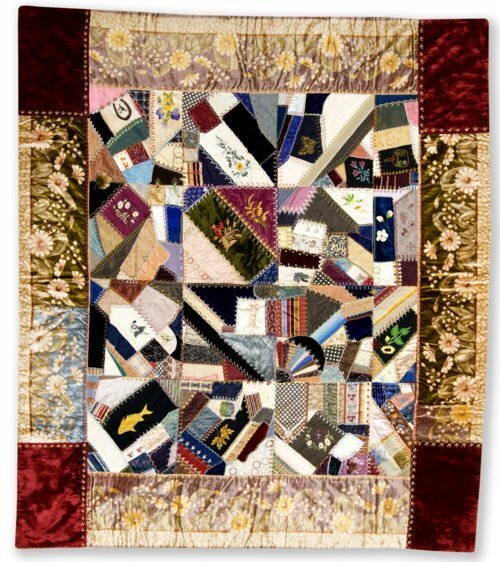 Crazy quilt featuring elaborate embroidered designs, including a horseshoe, fish, frog, and flowers. Numerous embroidered rings probably indicate it was made for a wedding. It was passed down in the family of Samantha McConnell, whose daughter, Jennie, married George Janes in 1888. The embroidered initials "GKJ" likely stand for George K. Janes, and "JM" for Jennie McConnell. Samantha McConnell was born in Pennsylvania in 1843, and moved from Ohio to Kansas with her young family sometime in the 1870s. In the 1880s they settled in Franklin County near the town of Ransomville.